Since Marquez’s diagnosis, she has undergone several Chemotherapy treatments to help get rid of the cancerous tumors. “She is definitely a fighter. She is mentally prepared for all the physical changes…she has her moments, for sure. 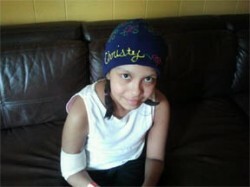 She has her hard days, but we both are putting our faith in a higher power,” said Duran. Unfortunately, this isn’t the first time Duran has experienced this kind of worry. Before Marquez’s diagnosis, Duran’s 6 year-old daughter Brianna succumbed to the same type of cancer a year earlier. “The doctors and I were shocked when Brianna was diagnosed and then again when Veronica was diagnosed this past summer,” said Duran. “We are all trying to figure out why this is happening and we can get through this together.” According to Marquez’s doctors, 10 to 15 cases of Neuroepithelium surface yearly.